Sanders is a Jewish member of the Senate Democratic Conference whose presidential campaign has taken off among Democrats, propelling him to leads in polls over former Secretary of State Hillary Rodham Clinton. Clinton&apos;s campaign has stalled amid criticism she is too guarded and defensive in public, while Sanders has consistently demonstrated he&apos;s not afraid of mixing it up with the press or an audience — even one as unlikely to get behind the Vermont senator as the one he faced Monday. "I came here today because I believe that it is important for those who hold different views to be able to engage in civil discourse — not just to shout at each other or make fun of each other. It is very easy for those in politics to talk to those who agree with us," Sanders said. "It is harder, but not less important, for us to try to and communicate with those who do not agree with us on every issue and it is important to see where, if possible ... we can find common ground." 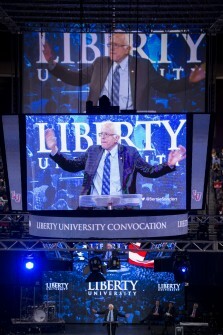 Before Sanders entered the campus&apos; Vine Center to an introduction by Liberty President Jerry Falwell Jr., a campus band played Christian rock songs about the resurrection, including one with the refrain: "I have decided to follow Jesus. No turning back. No turning back." Not the typical introduction for a Jewish socialist from Vermont during Rosh Hashanah. "For me personally, it wasn&apos;t very awkward," said sophomore engineering student Joe Sobchinsky. "I actually was very happy that Bernie Sanders was coming because college is supposed to be about learning different viewpoints, and even if you don&apos;t agree with someone, I would absolutely listen to them and hear what he has to say, hear his viewpoints." Freshman Liz Doherty from New Jersey attended a graduation ceremony for an older sister when former Massachusetts Gov. Mitt Romney, the 2012 GOP presidential nominee, was more well-received. She said to expect a bigger reception when retired neurosurgeon Ben Carson, a conservative presidential candidate, addresses Liberty later in the year. "I think there will be more standing ovations. I think there&apos;s going to be a lot of cheering coming from our part compared to this one," Doherty said. "I, myself, was a little fearful of what was going to happen today, but I&apos;m glad it all worked out and we showed respect and we showed the Liberty way." Some of the most intriguing people in the crowd were the guests sporting Bernie Sanders for President apparel, many of whom took prominent seats on the floor of the basketball arena. "I was subjected to convocation for several years before I moved off campus, and then I did not ever come again," said Liberty graduate Bethany Walker, who lives in Lynchburg, Va., and was sporting a pro-Sanders shirt. "I know that they invite people ... so as to appear neutral even though they clearly are not, but I think because they are a religious institution and they&apos;re tax-exempt, they&apos;re kind of compelled by their attorneys to make it an even opportunity." 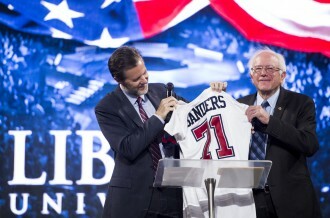 Sanders tailored his speech for the venue, peppering his social justice message with quotes from the Bible. One point where the 74-year-old presidential candidate got cheers and applause from beyond the folks in the Bernie shirts was discussing his call for at least a dozen weeks of federally mandated paid family leave. "In my view, there is no justice when low-income and working class mothers are forced to separate from their babies one or two weeks after birth and go back to work," Sanders said. "I want you to think whether you believe it is a family value that the United States is the only major country on Earth that does not provide paid medical and family leave." As foreign as Sanders&apos; message was to the Liberty audience, he was not the first major speaker from the left. In 1983, Sen. Edward M. Kennedy of Massachusetts addressed students on religious toleration at the invitation of Rev. Jerry Falwell in what became one of the most memorable speeches by the liberal lion. Related: Bernie Sanders Vs. the Media See photos, follies, HOH Hits and Misses and more at Roll Call&apos;s new video site. Get breaking news alerts and more from Roll Call in your inbox or on your iPhone.